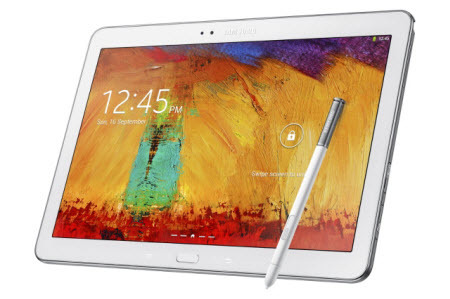 Samsung has thrown its latest Note 10.1 inch tablet dubbing it after the future as 2014 edition for the coming year. The latest iteration, aptly named the 2014 Edition, is better in every conceivable way-it’s lighter (only 1.19 pounds), faster (comes with Android 4.3 installed), ships a higher resolution 2560 x 1600 display. Display Impression: None company does better job than Samsung in screen display when Samsung’s PC monitors performanced outstanding in retrospect. The Note 10.1 2014 Edition outshines most competitors in its class with a 2560 x 1600 resolution and 299 ppi pixel density, That’s say, it looks absolutely drop dead gorgeous to watch movies or HD videos over the screen. A good news for video lover is, Samsung increased battery capacity from the 7,000 mAh first gen note 10.1 to 8,220mAh. That would mean it will last 7.5 to 8.5 hours of actual use time in mix of web browsing, email exchanging, social networking , handling normal working trifles and watch a whole DVD movie on Samsung Galaxy Note 10.1 without worrying about charge issue. MacX DVD Ripper Pro is an ultimate DVD decrypter software which can easily rip any DVD to Samsung readable formats, fully resolving the problem that there is no DVD drive on Samsung Galaxy Note 10.1 (2014). Additionally, you can also customize your video by adding subtitles, cropping the edge, trimming unwanted part, toggling the volume to sleekly watch DVD on the tablet with sharp and bright display. After free download DVD ripping software, import the DVD disk you want to convert, you can also load DVD folder or DVD ISO image in the main interface. To execute the conversion from DVD to Samsung tablet, choose Samsung Pad Video profile under Android Pad category. Step 3. Specify Output Folder. Assign output path on your Mac to save the converted video file. Click "Browse" button to choose the path where you want to save the output file in. After all those steps, click Run button to manage the conversion process. After ripping process finished, you can find the output video in the destination folder and then move it to your Samsung Galaxy Note 10.1(2014 Edition). The best DVD ripper for Mac endows users up-to-date DVD decrypting technology to ensure proper rip for various copy-protected DVDs, namely CSS, region code, Sony ArccOS and even the new Disney protection encoding. With this Mac DVD ripper software, you are not able to watch the new released DVD like Despicable Me 2, The Conjuring, The Great Gatsby etc on Samsung Galaxy Note 10.1(2014 edition), but also watch DVD movies on other Samsung breed including converting DVD to Galaxy S4/S5/S6/S7, iPhone iPad etc. Tips: to transfer DVD to iPhone iPad etc. iOS devices, you can rely on MacX MediaTrans, a great iTunes alternative for Mac (Windows version is also available), for faster DVD movie transfer experience. This tablet review gives detailed information of iPad Air, Nokia Lumia 2520 and Samsung Galaxy Note 10.1 2014 Edition with regard to size, display, OS, processor, battery, price, etc. Read this review to know how the two tablets stack up against each other. Unable to play DVD movies on Samsung Galaxy S4? 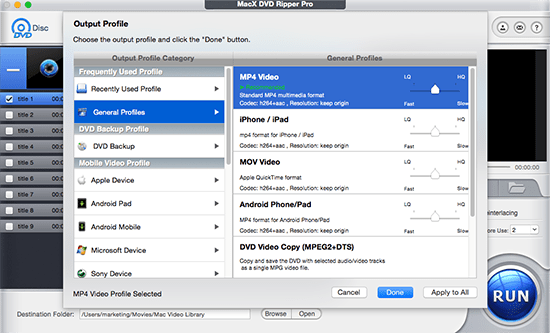 This article gives tips and tricks to rip DVD to Galaxy S4 recognized video format with MacX DVD Ripper Pro. Download this DVD to Galaxy S4 ripper and enjoy DVD movie on Galaxy S4 on the move.